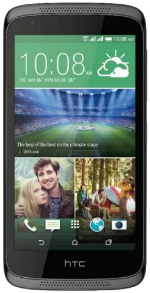 The HTC Desire 526 comes with a 4.7-inch display with a resolution of 540x960 pixels and a 234ppi density. Powering it from within is a 1.1GHz quad-core Qualcomm Snapdragon 210 processor with 1.5GB of RAM, the Adreno 304 GPU, and internal storage of 8GB with a microSD card slot for memory expansion of up to 200GB. The camera is equipped with an 8MP rear-facing camera with the ability to record 720p HD videos. A secondary camera is available in front with a 2MP sensor. The phone is equipped with a Li-Ion 2000mAh battery that helps the device last up to 25 days of standby. Upon unboxing, the phone runs Android 5.1 Lollipop OS with HTC Sense 7 UI and 4G LTE connectivity available. The phone is available in black.